The 221st Merseyside Derby was a pulsating affair which both sides could have won - before Sturridge's late strike ensured the points were shared. The reds missed out on the chance to take an early lead at the top of Premier League after throwing away the lead twice. When Everton managed to get themselves ahead last in the second half, it was Liverpool who had to dig deep to ensure the 3 point difference between the clubs remained. Roberto Martinez was marking his first Merseyside derby, whilst Brendan Rodgers now has 3 draws in 3 attempts against the old enemy. Luis Suarez was named in the reds team, but Daniel Sturridge was left on the bench. The pre-match suggestion was that his thigh injury had been aggravated following a full 90 minutes on Tuesday playing in England's pointless international friendly. Another day, more defensive changes, and Jon Flanagan was selected at left back in Jose Enrique's absence, as Rodgers decided for the second consecutive game that a back four was back in favour - Toure and Sakho watched on from the bench. Joe Allen was selected in a midfield foursome. Liverpool broke the deadlock first in the 5th minute. Steven Gerrard floated in a corner, nodded on by Suarez and Coutinho shot past Everton's bearded keeper. But Mirallas equalised just moments later, when the reds failed to defend a free kick for the 8 millionth* time of the Brendan Rodgers reign. In the 19th minute Luis Suarez scored the goal of the game and restored Liverpool's lead. After being felled by Gareth Barry he produced a fantastic curling free kick that flashed past Tim Howard. 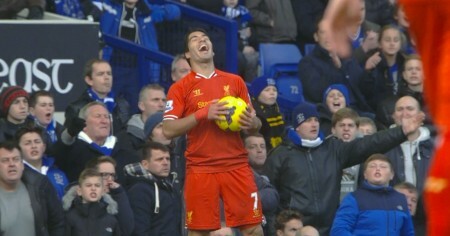 Suarez was then the victim of a reckless challenge by Kevin Mirallas who slammed his studs into the back of Luis' knee. It was a red card offence, but as is the history for many decisions in this fixture - the punishment did not fit the crime. Mirallas was handed a yellow. How he didn't even pick up another yellow in numerous incidents later is another mystery. Liverpool dominated the majority of the half and came out of the second looking set to add to their goals tally. 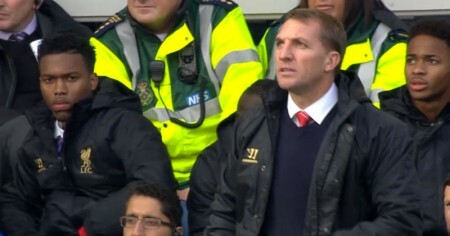 But the fate of the game appeared to swing when Joe Allen missed a glorious chance to put the reds 3-1 up. Suarez passed the ball to the Welshman who only had to place the ball into the net. He shot wide. He was removed shortly after this faux pas, but by then Everton had moved into the ascendancy. Mignolet had denied a number of decent chances from Everton, but eventually the powerful Lukaku beat the Belgian, when he slotted in a cross from Mirallas. 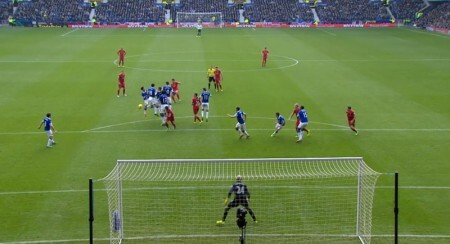 With less than 20 minutes left Lukaku headed Everton into a 3-2 lead when Liverpool failed to make any decent attempt at defending a corner. Sturridge was sent on to see what he could do, and fortunately he did get his head onto a Steven Gerrard free kick in the last minute of normal time. 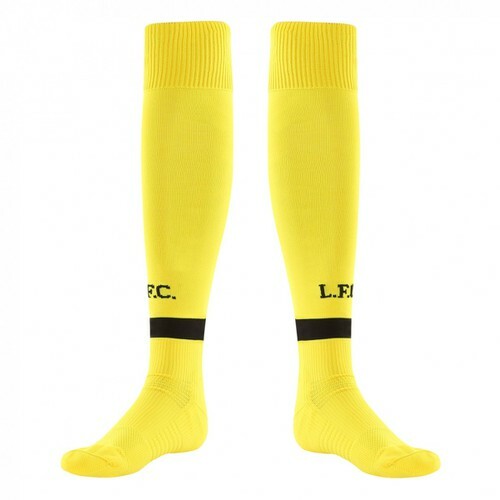 There was still time for a winner with Suarez and McCarthy having late opportunities. Liverpool and Everton are riding relatively high early on in this season's Premier League season under the tutelage of two former Swansea managers. Today's game was a great advert for the improving form of both sides.